Last Week, on Thursday, March 7th, the second @OracleIDM Tweet Chat (AKA Tweet Jam) was held. It was great to participate with many others on this lively and informative chat. The Chat Archive for #MobileIDM has been posted here for review. In the discipline of database design, Entity Relationship diagrams are used to diagram database schemas. In a database, neither entity nor relationship is complete without the other. It is the definition of relationship between data elements that adds value – hence the pervasive utility of the relational database. A simple “Identity Relationship Diagram” (my term) helps to illustrate the concept. 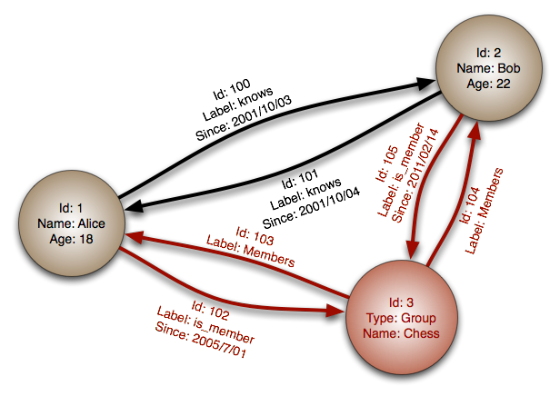 Identities are shown in boxes; relationships are shown as arrows. We can visualize identities as nodes, each with relevant properties, and relationships between identities as edges. Interestingly, the edges, or relationships, may also have identities and properties of their own. 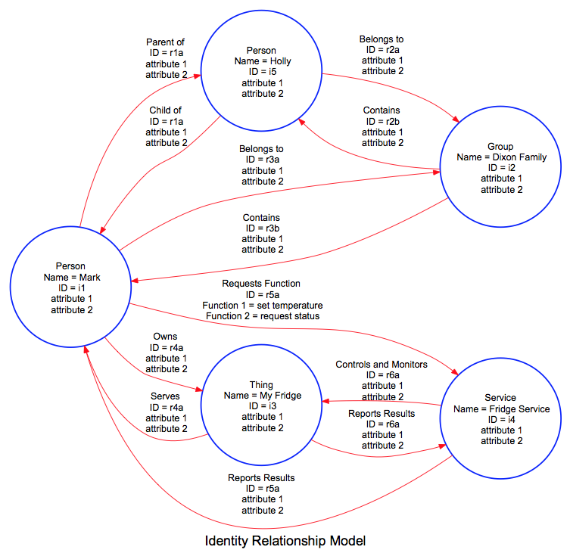 After further study and thought, I believe that “Identity Relationship Diagrams” can be very useful in illustrating concepts in the Identity and Access Management domain. The following diagram, prepared using Graphviz graph visualization software, is helpful to illustrate two general areas of discussion. The top half of the diagram illustrates basic relationships between individuals how those individuals can belong to groups. 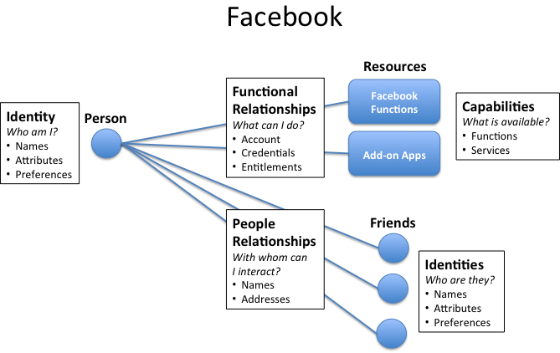 This is the basic construct of the Facebook Identity Graph. 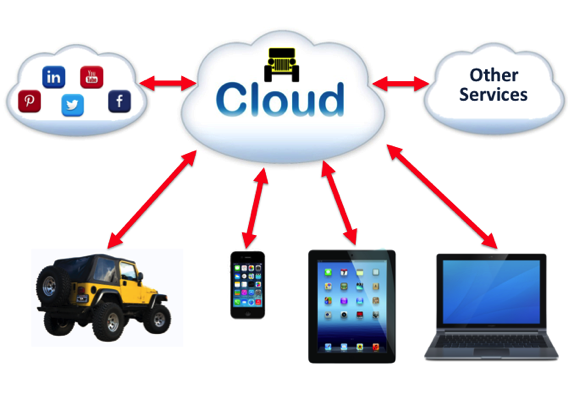 The bottom half of the diagram illustrates how people interact with things via services. These are the basic elements in the Internet of Things. My thoughts about how to use this diagramming method are still developing. Stay tuned for more. Whether or not we need, as Ian suggests, to completely restructure IAM systems in order to progress is still subject for debate, but the concept of thinking about and representing relationships between identities in a directed graph format is intriguing to me. 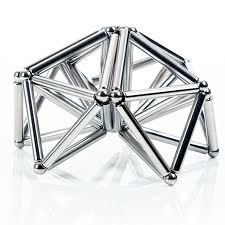 According to Wikipedia, “Graph databases are based on graph theory. 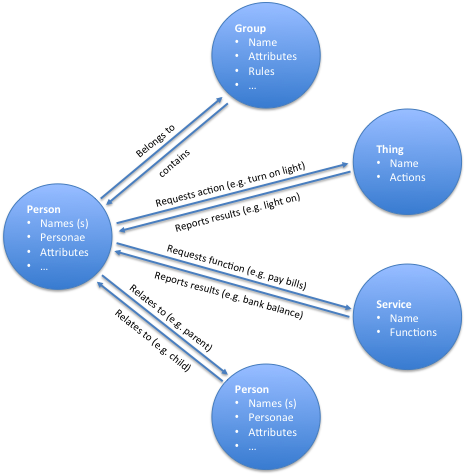 Graph databases employ nodes, properties, and edges.” The following diagram gives a simple example. Using this method, we can visualize identities as nodes, each with relevant properties, and relationships between identities as edges. Interestingly, the edges, or relationships, may also have identities and properties of their own. The relationships (edges) are primarily verbs that describe what actions the relationship supports. A primary role of identity management systems is to establish these relationships between people identities and service or thing identities in such a way that valuable actions can be performed. These are a few of my thoughts. What do you think? PS. Can anyone recommend a good directed-graph drawing tool for Mac? The first table lists a few people relationships I have. The first, my wife, provides value to me (that sounds kind of crass, actually) in all areas. Her economic value comes not from revenue (she chose dual careers as Homemaker and Stay-at-home-Mom), but in her thrift, wise use of money and sound economic advice. In addition, I deeply value her wisdom, friendship and spirituality. My relationship with Claudia is in quite stark contrast to my very distant relationship with my employer, Larry Ellison. Sorry, Larry, I see the value of our relationship as primarily economic, although I must admit receiving a bit of intellectual stimulation from reading about your personal exploits. On the other hand, my relationship with John, a colleague at Oracle, began as an economic relationship as we worked together in the sales organization, but grew into a deep friendship, with intellectual, emotional and spiritual value. The final example is Neil, the Bishop of our church congregation and close neighbor. We have developed a friendship I value highly, based on strong spiritual, emotional and intellectual relationships. It could be an interesting experience to assess the value we receive from all of the people with whom we interact in some way, but the real purpose of this post is to explore the value of relationships with information systems. The following table illustrates a few of the systems with which I interact regularly. I definitely have an economic relationship with Oracle Payroll. Twice every month, a nice paycheck drops into my bank account, and I log onto the payroll system to see how much money I pay in taxes and investments. While I admit to deriving some emotional satisfaction from that process, we’ll let it remain as an economic value. In contrast, the different email systems I use can provide value across the board, as I communicate with people on a wide range of subjects. In social networks, LinkedIn is the vehicle I use to primarily keep track of professional colleagues and associates, although I get emotional value out of maintaining and building friendships with people across miles and time. Facebook, on the other hand, is where I actively seek to strengthen emotional and spiritual ties with friends and family. Kindle also sweeps the board – my virtual bookshelf contains titles that provide value in all four areas. This brings me to a couple of examples of my relationship with “things” that deliver value. I can monitor and control my new home alarm system from an app on my phone. The system provides economic protection and emotional peace of mind. Finally, my remote thermometer satisfies an intellectual curiosity about how hot it is outside, here in the Arizona desert. It is important to note that how a person uses or views a particular system may influence the value he receives. For example, I know of people who leverage Facebook primarily for economic advantage. I just choose not to do that. Exposed Personae: Certainly different facets of my personal identity are exposed as I interact with different people. Larry Ellison will never see (even if he cared to) parts of my personality that I have reserved for my closest friends. My closest friends will never know of parts of myself I share only with my wife. Context: The context of relationships differ, depending on time of day, distance apart, frequency of interaction, mutual interests, etc. Such differing context has a large impact on the value derived from relationships. Connection method: How does the relationship connect me with the person or system? With people, is the relationship primarily in person, by phone, via email, via a social network or all of these? Is a digital identity required to enable the relationship? Available functionality: For systems with which I interact, what functionality is available? What can the system deliver that delivers value to me? Authorized access: Of the sum of all functionality in a system, what am I authorized to use, or what functions do I choose to use? Yesterday’s post illustrated a few cases of how relationships can exist between identities and resources or identities and people. I propose that we should focus not which relationships exist, but on what value can be derived from each relationship. In interpersonal relationships, hopefully, value flows to both parties. In the case of employee relationships with enterprise systems, hopefully value accrues both to the employee and employer. In the case of individuals connecting to online systems or things, hopefully each person receives value from those relationships. And Identity is at the core of making these relationships happen. In line with my post yesterday about viewing identities and relationships from the vantage points of “enabling” and “protecting,” I created three diagrams to illustrate how relationships between people and resources or other people provide the opportunity for value creation. The first diagram illustrates the relationships a person may typically have with information resources within an enterprise. The objective of these relationships is to connect individual people with the applications or systems that may deliver value, both to the individual and to the enterprise. Typically, these relationships are granted and governed by the enterprise. The second diagram illustrates a person’s connection to items within the emerging Internet of Things. In some ways, this model is similar to the enterprise model, in that connections are made between people and resources. However, in this model, individuals typically would initiate and govern their own relationships with things that would deliver value to themselves. In the third model, people establish relationships not just with functions or services, but with people, effectively connecting identities together via a social relationship platform. In line with my comments yesterday, I propose that in each of these cases, relationships must be established to “enable” people to derive value they seek. Both Identities and relationships must be “protected” to prevent the wrong people from interfering with a person’s desire to derive value from the relationship, whether it be with a function, service or other person. That’s all tonight. More on the morrow. Nishant: @iglazer If an account being provisioned to a person is a relationship, if attributes are related to a person, then IAM=Relationship M. So..
Nishant: @iglazer So…, question is what is the difference between Identity Management and Relationship Management? Where is the separation? First, I agree that from an information security standpoint, the perimeter has drastically shifted. There is no longer a firm physical or logical perimeter around an enterprise that can be hardened sufficiently to minimize risk to the people and systems inside. To realize that we must focus on the individual rather than the enterprise boundary as a first line of action and defense certainly seems wise to me. But what is the correct terminology? is IAM really Relationship Management? Is Identity the New Perimeter? Are Relationships at the real border? A digital Identity represents a single person or thing in some way. A digital Identity can certainly include attributes or characteristics that uniquely identify such a person or thing. A digital Identity surely has value and meaning in and of itself. However, I believe relationships are what give Identities real substance, particularly as we consider the subject in light of current and emerging business models. Real-world relationships constitutes linkages between individuals, or between individuals and organizations, or between individuals and things. We may describe digital relationships as the attributes, permissions, entitlements and roles that define how digital identities are linked with organizations, people or things in the overall ecosystem in which the identities reside or participate. So, is it appropriate to talk about “Identity Management” or “Relationship Management?” I propose that both are included in the common definition of Identity and Access Management. Surely, IAM includes managing individual digital identities (e.g.- names, attributes, credentials). However, IAM also includes the management of relationships – assignment of entitlements to an identity is a good example. However, I think “management” is the term that is out of whack – not identity or relationship. Management typically implies one way force, control or direction. This is the case for traditional IAM – the enterprise creates, owns and governs the identities and associated relationships for all of its users. On the other hand, in the philosophy behind personal identity management implies that each individual should create, owns and governs his or her own Identity free of coercive control from an enterprise. As an individual, I want to participate in systems that “enable” me (as defined by my digital identity) to form relationships that deliver value to me. I also want systems that “protect” both my identity and the relationships I enter against threats from impostors, thieves and vandals. On the flip side, I think enterprises seek similar value. They want to “enable” their users (think digital identities) to establish relationships with systems, people and things that will deliver value to the enterprise. They also want to “protect” the identities and relationships of their users against threats from bad folk. The CRM/VRM debate is an example of looking at relationships from different viewpoints. At one extreme is the enterprise wanting to exert onerous control over all its customers to maximize commerce – hence customer managed by enterprises. At the other extreme is the enlightened consumer wanting to be free from enterprise tyrany – or vendors managed by consumers. However, the optimal answer probably somewhere on the scale between the extremes. In both cases, if we concentrate on what both parties really want, we will progress to a more optimum solution. If we are to progress toward a highly cooperative ecosystem where multiple relationships deliver superior value as envisioned by “Emergence of the Relationship Economy,” we must build infrastructure to “enable” and “protect” identities and relationships from multiple points of view.